Esinduse tasemel Peugeot ja Citroen diagnostikaseade. Seade on uus. Garantii 1 aasta. Seade on kohal. Dealer’s diagnostic scanner for comprehensive diagnosis for Citroen and Peugeot cars. You can do all as an authorized Dealer does. This diagnostics software allows you to perform complete diagnostics of all from 1995 till present models. 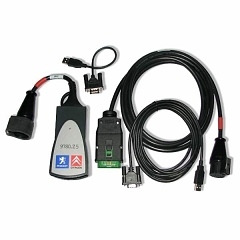 Diagnostics is performed via OBD II connector (which is located near steering wheel) or via manufacturer-specific connector (only older cars, pre-2001). Displays all stored and pending fault codes with complete description (e.g. “Rail pressure - too low pressure”). This feature is of great importance in all vehicles because systems like Engine control units, Immobilizers, Airbags, Alarms, Body Control Units, and some others, require you to perform reset or programming procedures after car repair is done, or even configuration after replacing broken Control Unit. PPO Software supported language: English, Chinese, German, French, Japanese, Russian, Arabia, Spanish, Turkish, Danish, Iranian, Greek, Israel, Hungary, Indonesian, Italian, Dutch, Norwegian, Polish, Portuguese, Finnish, Slovenian, Swedish, Czech, Croatia, Thai. Lexia Software supported language: English, German, French, Japanese, Russian, Spanish, Portuguese, Swedish, Turkish, Dutch, Polish, Italian, Hungary, Greek, Czech.